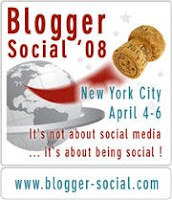 So about 8 months ago (give or take) CK of CK's Blog, started telling me about something called "Blogger Social" and lecturing me on how important is was that I go to it. Now even at that point, I should have known to always trust CK. But the idea of spending a weekend with a bunch of people I barely knew who'd all be calling me "Toad" was about the last thing I wanted to do. So I kept hoping she'd drop it and every time she'd ask me about it, I'd just change the subject or pretend I didn't hear her or something. Smartest move I ever made. Thank you CK. For not letting me weasel out of it. This was one of the best weekends of my life. I met so many very cool, very smart, very unique people. (All of whom I will forever think of as "@johndoe" but that's another story.) Learned a whole lot. And realized just how much I love writing this blog and the contacts and conversations it brings. But mostly I wanted to use this post to thank CK. For finding me. For chatting me up to Ann Handley which lead to the gig on MP DailyFix. And mostly for talking me into the very wonderful thing called BS08. And we're all glad you finally came out of your amphibian shell and proved once and for all that there is a real live human behind that orange avatar! It was a pleasure seeing you again, Alan. The wonderful CK can be very persistent -- and I'm glad she bugged you into submission!! Great seeing you again, even though I swear that time ran at a faster pace Friday night.... it must have been at Internet speed. I only wish we had more time to talk. I was very pleased to meet you, however. This means a lot, friend. So much. I can't tell you how dear I hold your trust. I simply could not imagine your not being a part of this. And so I ensured that did not happen. How could you miss out on being a part of something great when you contribute so much and help me so much, too? Sometimes I think that CK knows what's best for all of us, even if we don't ;) Glad to see that the Toad is a real person! The funniest thing this story? After reading your blog for months, I hopped over to the Flickr group for BS08, found a photo of you and went "Wait minute, I used to WORK with this guy"
Too funny. Keep up the good work, Toad. @Cam/Mack- just as nice to finally meet both of you. As a native NYer I'm sorry family commitments kept me from being a better tour guide. @Steve - So nu? Who are you? Send me an email at tangerinetoad at gmail dot com to say hey. I'm so glad that, out of 1300+ pics at Social, we FINALLY (! )found a pic of us...and that it's the one where you hugged me. Because after you thanked me that night and had to leave, I was so touched that I teared up (happy tears). I started off hiding too. But you know, things get better the more of yourself that you give away. It is the letting go that is hardest of all. Glad I got to spend at least a few moments with you! It was fun talking with you at the party and relaxing at Steve's house on Sunday, where we could all just kick back. I'd love to chat again next time I'm in NY. Being alien to the ad world, it'd be great to hear some real scoops and adventures on the battlefront. I have an alter personality myself on another blog I write, but he won't be coming out for a while. @gavin - wise words. hoping for a full-on decloak sooner than later. @mario- great meeting/hanging. Appreciate the comments here and elsewhere on the blog.